Bizarre Creations has painted a target on the heads of Nintendo by making the claim that its new kart racer, “Blur,” is “Mario Kart” for adults. Can it take the crown or does it come up short? Is it all sheen and no show, or is it a truly special and worthy experience? The game has plenty of style, but does it have substance? Read on to find out. 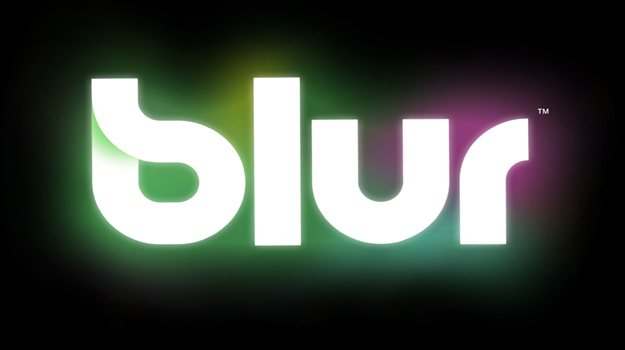 Blur wears its style on its sleeve. The power up effects make for some good eye candy, and the presentation is top notch. The rest of the game’s visuals are nothing particularly special; semi-realistic styled graphics with a shiny veneer. In this case though, the presentation really does make all the difference in the world, turning an average looking game, though a very thoroughly polished one, into a very stylish and visually appealing game. The game’s sounds follow a similar pattern. There’s a certain indefinable synesthesic quality about the power-up sound effects that meshes with the visual effects during use and impact but the soundtrack is nothing even remotely memorable. Blur is not a terribly complicated game to learn. However, when you first enter a new single player event you will be greeted with an unskippable introduction cinematic which displays the nuances of that event, whether it be a race, destruction mode, or a time trial styled checkpoint race. This presents several problems, because while the goal was probably for these cinematics to help acclimate players to the game, they fail at every turn. There are no subtitles or voiceovers to properly explain what it is that you’re seeing on-screen, the pace is too quick to glean much, and they convolute a simple enough game. If you really need a primer, try each racer’s tutorial, because the cinematics are at best only marginally useful. Surprisingly, the difficulty for each setting, easy, medium, and hard, is more fitting than I’ve ever seen before in a racing game. On easy, you will have to drive with your toes in order to avoid overlapping the AI drivers, on medium you won’t sweat too much, but you won’t cruise through it either, and hard is, well, hard; the enemy AI becomes super aggressive and the rubber banding becomes more than a little noticeable. The campaign tasks you with earning lights in each event in order to unlock more stages, or rival racers’ events in this case. 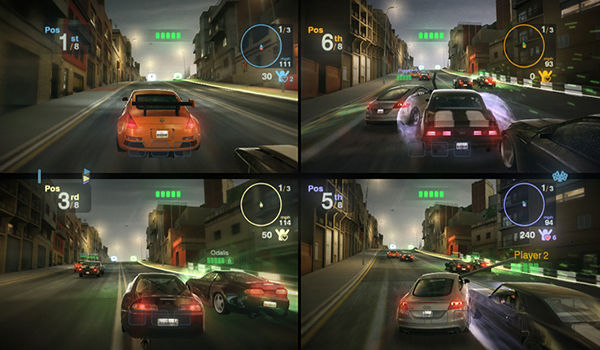 There are 7 lights to be earned from each event; one for scoring a certain number of fans, or points, one for drifting through a series of gates, and 3-5 for completing the game mode’s objective, whether that is to finish 1st, destroy a certain number of cars, or finish a race in a certain amount of time. 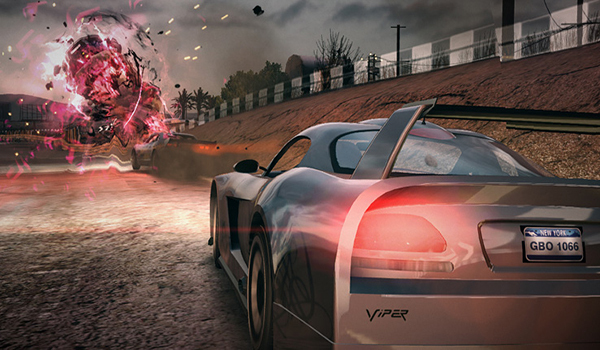 Each rival racer will task you with a list of demands to complete during his or her event, such as wrecking 100 enemy cars or completing a race without repairing, and completing these will result in a one-on-one boss race, the spoils of which are usually the best part of the single player, a modded (read: special ability) car, such as a Mustang with Titanium Shield, enabling you to use the shield power-up to play through other cars like an 18-wheeler channeling the Incredible Hulk. The progression of events is as linear as they come, and the game modes available don’t add a ton of flavor to the campaign, although destruction is quite is fun, but these special races and the criteria to unlock them make for an enjoyable, if not grindy, playthrough. Drifting is handled adequately, but it’s a potentially fun mechanic that is slightly dampened by the fact that no matter which car you use, with a few exceptions, the handling still manages to feel stiff. Instead of feeling satisfied at how well I took a corner, I couldn’t shake the sensation that I was trying to corner while my tires were a foot deep in mud. Handling falls in a no-man’s land between arcade and sim. The beauty of the gameplay, however, lies in the game’s arsenal of power-ups, 8 in total. Each one manages to fill a roll effectively, none of them seem like duplicates, and not a single one of them goes without its uses. Some can be used defensively, others offensively, while others are more versatile and can be used for both. Bolt, for example, fires three purple shards in quick succession and can be used to snipe forward cars, or fired backwards to keep the pressure off of you, but it can also be used defensively to fend off incoming shunts, the game’s big red homing orbs. Even better, the presence of these power-ups supplement the gameplay perfectly. They do not interrupt the focus of the game as a racing title, nor do they break the game’s balance. The creative applications for each power-up are slightly limited, but they are no less incredibly rewarding to use skillfully. The multiplayer seems to be modeled on the Modern Warfare franchise, with a few admittedly neat extras such as Twitter and Facebook integration, and the ability to tweet challenges to your friends. The experience revolves around an addictive grind of unlocking cars and mods, perks basically, and new game modes by completing races, achievements, and by performing actions mid-race, earning you experience points in the form of fans. With the final rank requiring 890,000 fans, it could take a while to unlock everything given that you will average 1,000-1,500 fans per race. Unfortunately, a debug game mode was left in the game when it was released, allowing for the acquisition of 100x more fans than normal. While this mode has been removed, ranks earned by any players who participated in debug races have not been retroactively removed, resulting in a few players already being maxed rank with access to the best perks and cars. There are also a few other bugs that stand out, one of which can infrequently reduce your framerate to sub-slideshow levels, and a rare one which keeps the lobby countdown in an infinite loop. Like the power-ups, perks do not completely break the game balance (although the unlockable cars have the potential to), and are a satisfying addition to the gameplay, but they can tip the scales. For example, some perks allow for extra fans to be gained, one adds laser sights to assist in aiming the bolt power-up, and another gives you a power-up when you use a shield to absorb an attack. Kudos to Bizzare for allowing some fun customization choices, beyond which car to choose, that don’t make or break the game. 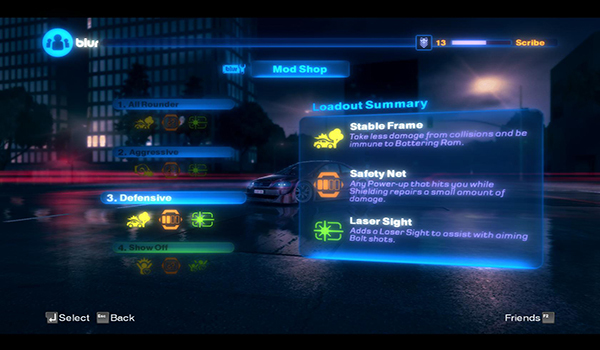 The game modes available consist of racing, motor mash, and team variants on these, along with a “pure” mode, free of power-ups. As an aside, these are all available in online, LAN, and 4-player split screen. Racing against actual players, especially in large races, can become hectic quickly, it is often times a symphony of flashy translucent effects until a few players pull ahead of the pack, which can leave you feeling defenseless at the start of the race, and hopeless from then on. Smaller races feel just right though. In spite of being flawed, racing, no matter how many players are participating, definitely has its appeal. Motor mash is a veritable demolition derby, pitting you on an open lot of terrain populated with rival cars and power-ups. You are given a countdown timer, and the freedom to cause as much destruction as you can. It is mindless fun, but it is good fun. There are no laps, no real structure, just you and your ability to utilize mines, shunts, shields, etc. It feels a bit empty, as though Bizarre could have done more with the concept, but it satisfies the urge to destroy by using Blur’s staple gameplay mechanic effectively. While the online mode is addictive and highly enjoyable, even if it is a little flawed, there are not many people playing it on the PC. So far, there have only been between 60 and 110 people online at a given time, and some game modes are void of players all together. 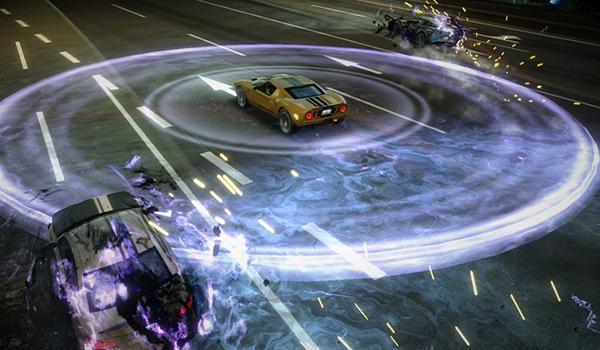 Racing is the most densely populated, averaging about 40-50 people playing that mode at a given time, while motor mash ranges from 5-20 players at a time. Bizarre can’t really be blamed for this, but it certainly does hamper the fun when you have to struggle to find a populated game. So while Blur may be flawed in several ways, it is no less a memorable and fun experience. It is unfortunate that the online is currently under-populated, but that can be changed. What it does poorly can often be overlooked, or at least tolerated, in lieu of the fact that all of what it does right, it does magnificently. If you have been parched for a good kart racer since Mario Kart came out, Blur will slake your thirst.